According to a report, 94 percent of all email sent is spam. In plain english, it is unwanted email that automated bots and software send you for the sole purpose of advertising and in many cases, phishing and online scams. You’ve probably got a lot of them and so has everyone. Once a spammer gets hold of your email address, he will bombard you with spam email. If you have a powerful spam filter in your mail client (like gmail), it should be taken care of, otherwise God save you. Email Spammers collect email addresses from different places like chat rooms,Â websites, newsgroups, blogs etc. Automated bots surf through sites to look for email addresses. This is the reason most people type their emails with extra spaces in between so it is regarded as invalid by the bots. Anyhow, one thing which can differentiate a bot from a human being is a captcha test, which requires a person to type the gobbled up letters, displayed on an image. This hurdle cannot be passed by automated bots and thus saves us from spam. People usually create a disposable email address (like with Mintmail and Meltmail), but it is not the only option to fight email spam. There are many, and we will list 4 new ones today. Whspr is an online service that hides your email address and instead presents a contact form which people can fill out and contact you. You can set an expiry date for the form (limited to one year) and type in a discription for the form which the visitor can read. You can pass along the url of the form instead of passing your email id. 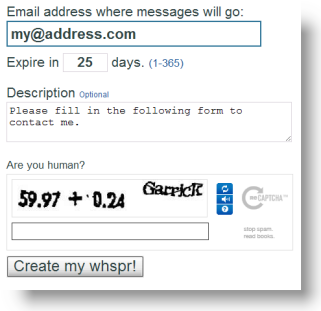 Â When you create a whspr form, you have to complete a captcha test and so has the sender. When somebody contacts you through the form, he’ll have to mention his email so you’ll be able to reply him once you get the message. Check out this whspr as an example. Scri.im is a pretty cool service, I’d say. It makes a user pass a captcha test before he sees your email address. There’s no signup required and all that’s needed is that you input your email address and give in a custom url you’d like. So instead of posting your real email in the wild, you can simply post a url like www.scr.im/keshav . Once a user opens that page, he will be presented with a captcha image and six block of letters from which, he will have to click on the indentical one. Once that’s done, your email will be shown. Piciy basically gives you a bit of code that you can put on a web page. On execution, the code turn into a linked image and when the image is clicked by a user, a slick on-screen pop up appears with a contact form in it. Your email is not exposed. When you get started, you’ll have to input your email address and the contact form image’s url (one the user clicks for the form to appear). You can also use the default image. Â Then you’ll have to enter a ‘start message notice’ and a thank you note that appears when the message is sent. After this, you can paste the given code on the webpage you want it to appear on. Although one of the most original approaches towards decreasing spam, I don’t see reCaptcha’s Mailhide service used by many people. So I thought I would include it here so that people could know about it. This is how it work. Once you enter in your email, you have the option of sharing it either through a url or by inserting the given html code in the required page. The output of the code will bring a truncated email address and the user will have to click it to see the full email addresses passing a captcha test in the process. There are alternatives that are better. We have a FREE technology weâ€™ve created that solves the usability issues that burden users of conventional text based CAPTCHA, but still effectively stops spam â€“ this means you build better sites. Vidoop now has an IMAGE BASED CAPTCHA solution.